The Bird & Bat Control (BBC) is best known as a starling repeller. Its sound is like a jackhammer or like exaggerated cicadas. The BBC is often used in conjunction with other sounds, such as the Electronic Scarecrow (ESC), to control a range of birds, including Blackbirds, Crows, Currawongs, Lorikeets, and Starlings. This bird control unit is able to emit ultrasonic sounds of over 20,000 Hz. As such, it is effective for use with flying foxes, kangaroos, wallabies, and possums (when used in conjunction with strong floodlights). An interesting by-product of the BBC's high frequency output, is that some lycee growers have noticed that where they have a BBC, they have very little sucking moth damage. It appears the moth "hears" the ultrasonic sound waves and believes an insect-eating bat has "locked" on to it with its ultrasonic echo location. This causes the moth to drop straight to the ground to avoid being eaten. The BBC bird control unit can be used to run a sonic fence (a series of speakers 30m apart) made up of as many as eight speakers to form a wall of sound, 210m in length. It can also be used as a part of a multi-blaster, which is a four way (360º) speaker run by two sound generators. 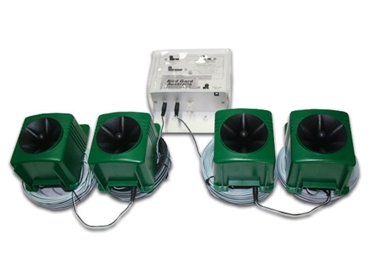 This enables the bird control unit to output two different sounds in a 360º circle. In either sonic fence or multi-blaster form, an 85amp fully charged battery will power the system, non-stop, for two - three weeks. As with all Bird Gard sound generators, the BBC bird control unit is fully automatic. It has a light sensor that can be set with the flick of a switch to day, night, or 24-hour operation. There is no need to physically turn the BBC bird control unit on in the morning or off at night. The BBC bird control unit is also contained in Bird Gard ’s new MSF/BBC unit. This combines all the sounds of the Bird X-8 plus a BBC unit in the one unit.